If you are looking at your red blood cell count on a complete blood count (CBC), you may see a number of different initials included along with the total count. 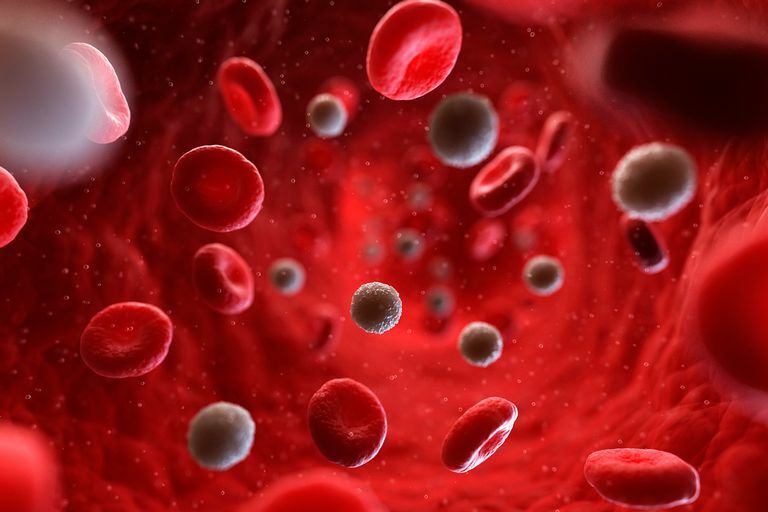 The red blood cell indices, called MCHC, MCV, MCH, and RDW give further information about your red blood cells and can be helpful in determining the cause of anemia and other medical conditions. Let's take a look at the information contained in your CBC) including your red blood cell count, and then discuss the meaning and importance of each of these indices. A low red blood cell count is referred to as anemia. There are many different causes of anemia, of which iron deficiency is only one. Red blood cell indices are very helpful in distinguishing these different causes. An elevated red blood cell count is called erythrocytosis or polycythemia. Causes may include dehydration (in which the level isn't actually high, but appears that way due to less fluid volume in the blood), a need for greater oxygen carrying capacity of the blood, such as living at high altitudes, COPD, or heart failure, and an increased production of red cells in the bone marrow due to conditions such as polycythemia vera. While looking at the total RBC count can tell you if your number of red blood cells is low, normal, or high, it doesn't tell you why the count is abnormal. Hence the need for further evaluation of these cells. Even if the RBC count is normal, looking at the RBC indices can sometimes give important clues in diagnosing medical conditions. Along with the total RBC count, the RBC indices provide information about the size and quality of your red blood cells. This can be used to diagnose the cause and severity of anemia and provide vital clues about other health conditions you may have. The RBC indices are comprised of four different components known as the mean corpuscular hemoglobin concentration (MCHC), the mean corpuscular volume (MCV), the mean corpuscular hemoglobin (MCH), and the red cell distribution width (RDW). Hemoglobin is the iron-carrying protein in red blood cells whose function it is to carry oxygen. It is also the element that gives red blood cells their color. Any alternation in concentration can cause the cells to appear more or less red. Iron deficiency anemia. Any number of conditions can cause iron deficiency anemia, including pregnancy, blood loss, poor iron absorption in the gut (caused, for example, with Celiac disease or Crohn's disease), and poor nutritional intake of iron. Whether hyperchromic or hypochromic, treatment is primarily focused on treating the underlying condition. Iron supplementation and the increased dietary of intake of iron can help treat iron deficiency anemia, but an iron supplement is not recommended for people who are not iron deficient (excess iron can be stored in the liver and heart). Blood transfusions may be used in more severe cases. Mean corpuscular volume (MCV) measures the average red blood cell volume, meaning the actual size of the cells themselves. A normal range for MCV is between 80 and 96 femtoliters per cell. Mean corpuscular hemoglobin (MCH) is the average amount of hemoglobin per red blood cell in a sample of blood. A normal range for MCH is between 27.5 and 33.2 picograms per cell. The MCH value directly parallels the MCV value, and some physicians find that the test is redundant. As such, if the size of the red blood cells is large (as measured by the MCV), the amount of hemoglobin per red blood cells will be high (as measured by the MCH), and vice versa. While the MCH can be used alone to determine if the anemia is hyper-, hypo-, or normocytic, the MCV has to be considered along with the MCH since the cell volume directly affects the content of hemoglobin per cell. Red cell distribution width (RDW) is a test which reflects the variability in size of the red blood cells (and is proportionate the standard deviation of the MCV). A normal RDW would mean that the red blood cells are all similar in size, whereas a higher RDW means that there is more variability in size of the red blood cells. Some physicians believe that RDW is one of the most helpful red cell indices in making diagnoses. Aside from its role in helping to diagnose anemia, an elevated RDW may predict the presence of coronary artery disease in people with high blood pressure. It also provides clues to an early nutritional deficiency which may not be noted with the other tests alone. Finally, it a good test for determining if further testing is needed, such as a peripheral blood smear. A normal range for RDW is 10.2 to 14.5 percent. It's important to note that these are only a few examples, and there are many possibilities. A CBC is a standard blood test and includes the red blood cell count in addition to white blood cell count and platelets. The red blood cell count can tell doctors about the number of red blood cells you have but says little about the reason for any abnormalities. RBC indices, by looking at the characteristics of red blood cells, are helpful in not only figuring out the cause of an anemia but in diagnosing medical conditions even when the red blood cell count is normal. The combination of these indices also gives important clues in narrowing down an anemia. The examples given above are only a few of the possible causes, and determining the precise cause of anemia is sometimes very challenging. These blood tests are best used in combination with a careful history, a thorough physical exam, and any imaging tests which are indicated. Nagao, T., and M. Hirokawa. Diagnosis and Treatment of Macrocytic Anemia in Adults. Journal of General and Family Medicine. 2017. 18(5):200-204. Shah, N., Pahuja, M., Pant, S. et al. Red Cell Distribution Width and Risk of Cardiovascular Mortality: Insights from National Health and Nutrition Examination Survey (NHANES)-III. International Journal of Cardiology. 2017. 232:105-110.